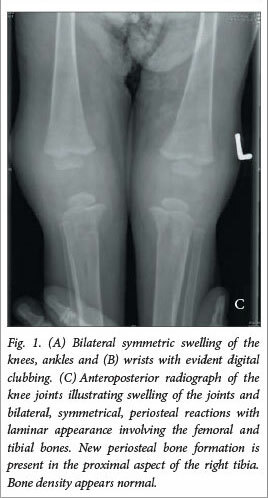 Hypertrophic osteoarthropathy (HOA) is an uncommon condition in children, consisting of a triad of digital clubbing, non-inflammatory joint effusions and radiographic evidence of periostitis affecting the hands, feet and distal long bones. HOA is classified as primary (idiopathic) or secondary to various diseases. Primary HOA is a familial, autosomal dominant condition also called 'pachydermoperiostosis', which usually manifests in adolescence and almost exclusively in males. It is associated with significant morbidity with advancing age. Secondary HOA is associated with a variety of conditions, of which the most common in children are congenital cardiac disease and chronic pulmonary infection. Uncommon causes of HOA in children are neoplasia (12%) and hepatic disease, of which very few cases have been reported in the literature. In adults, HOA is associated with chronic lung disease, malignancy and chronic liver disease such as primary sclerosing cholangitis, hepatocellular carcinoma and Wilson's disease. [4-6] An association with inflammatory bowel disease has also been described. In this case report, we present a patient with secondary HOA associated with biliary atresia and chronic liver disease. A 21-month-old female infant was referred to the paediatric gastro-enterology clinic with cholestatic jaundice due to biliary atresia. Owing to delayed presentation, the patient was not considered to be eligible for a Kasai procedure, and she did not qualify for liver transplantation due to a variety of reasons. On physical examination she was malnourished, weighing only 6 kg. She was jaundiced with obvious digital clubbing, hepatosplenomegaly and dilated abdominal wall veins indicative of portal hypertension. Respiratory and cardiac examinations were normal. She was also unable to walk. She was followed up and received supportive medication and vitamin supplementation for chronic liver disease and portal hypertension on a monthly basis. 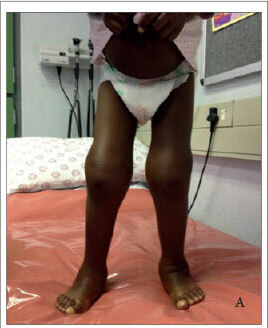 At the age of 2 years she presented with tender and swollen joints, and at that stage was still unable to walk. Joint involvement was symmetrical and involved the elbows, wrists, knees and ankles with tender peri-articular swelling and limitation of movement. The joints were not red or warm, but had prominent effusions. She had a genu valgus deformity of the knees and ulnar deviation of the wrist joints (Figs 1A and 1B). The patient's clinical picture was interpreted as hepatic HOA. The initial differential diagnosis included rickets, infective and reactive arthritis and chronic, inflammatory arthritis. Laboratory test results revealed: total bilirubin 284 µmol/l; conjugated bilirubin 157 µmol/l; alkaline phosphatase 770 U/l; y-glutamyltransferase 130 U/l; alanine transaminase 189 U/l; aspartate transaminase 413 U/l; albumin 17 g/l; a-fetoprotein 3.2 |g/l; an international normalised ratio of 1.35; corrected calcium 2.43 mmol/l; magnesium 0.94 mmol/l; and inorganic phosphate 1.59 mmol/l. Acute phase reactants were raised, with a C-reactive protein level of 31.9 mg/l and an erythrocyte sedimentation rate (ESR) of 150 mm/h. Infective markers, which included a white cell count, were within normal limits. Blood cultures were negative. A subsequent tuberculosis work-up, HIV enzyme-linked immunosorbent assay and auto-immune screen (which included HLA B27, antinuclear antibodies and rheumatoid factor) were negative. A synovial tap was not performed on the recommendation of the orthopaedic surgeons. Radiographs revealed bilateral, symmetrical, periosteal reactions with a laminar appearance involving the femoral and tibial bones. The same features were found on the ulnar and radial bones (Fig. 1C) An ultrasound of the knee and ankle joints confirmed the presence of bilateral effusions supra-patellar and anterior to the tarsal bones. The patient was started on a combination of prednisone and ibuprofen with dramatic improvement in pain, though the peri-articular swelling persisted. A repeat ESR was 50 mm/h 1 month after the initiation of treatment. Prednisone was stopped 4 months after initiation and ibuprofen 8 months later with no clinical worsening of symptoms observed. After regular occupational therapy, she started walking independently at the age of 3 years and 11 months. The patient still intermittently complains about mild pain in her right knee, but this does not preclude her from being active. HOA is an uncommon finding in children. It is a syndrome characterised by digital clubbing, swelling of the joints and periostitis of tubular long bones. Our patient had all of these features in the presence of chronic cholestatic liver disease. She did not have radiological evidence of rickets, her serum calcium and phosphorus levels were normal and she had been receiving treatment with alfacalcidol. We also excluded infective arthritis on the basis of bilateral joint involvement and improvement without intervention or antibiotics, as well as reactive arthritis and inflammatory conditions on the basis of negative serological tests. Patients with HOA may present with symptoms mimicking arthralgia and arthritis in large joints. These symptoms may be acute-episodic or chronic in nature, although asymptomatic cases have been reported. Our patient experienced disabling bilateral knee pain and deformity of the joints. The pain improved with analgesic and anti-inflammatory treatment. The cholestatic liver disease preceded and accompanied the development of HOA. According to Epstein et al., HOA may become clinically apparent approximately 6 years after the original diagnosis of liver disease. Our patient, in contrast, presented within 2 years. Radiological features, necessary for the diagnosis of HOA, consist of periosteal reaction with varied patterns over the diaphysis of long bones. The most frequent radiological finding is bilateral, symmetrical, periosteal new bone formation of the long bones. Other radiological findings include digital clubbing, osteopenia and soft-tissue swelling of the joints. Isotope bone scanning is a highly sensitive means of assessing HOA; however, its findings are nonspecific and can occur with other forms of periosteal proliferation[9,10] A bone scan was not performed in our patient, but the features of HOA were demonstrated with long bone roentgenographs. These features were bilateral, symmetrical, periosteal reactions with a laminar appearance in the femoral, tibial, ulnar and radial bones, with new periosteal bone formation in the proximal aspect of the right tibia. Bilateral effusions were evident in the knees and elbows. The treatment and prognosis of HOA are dependent on the underlying disease. Treatment can be classified into primary cause and symptomatic treatment. Primary treatments include tumour resection, chemotherapy, organ transplantation, surgical intervention and antibiotics. Symptomatic treatments include vagotomy, non-steroidal anti-inflammatory drugs (NSAIDs), steroids, biphosphonates (pamidronate and zoledronic acid), octreotide, epidermal growth factor receptor (EGFR) inhibitor and adrenergic antagonists. [5,12,13] Cases have been reported of complete clinical remission of hepatic HOA after successful liver transplantation. In our patient, arthralgia symptoms responded to brief treatment with NSAIDs and steroids. She does intermittently complain about mild pain in the right knee, but this does not impair functionality. The deformities have, however, persisted. It should be remembered that HOA can be asymptomatic in some patients. HOA may occur secondary to chronic cholestatic disease in children. While rickets and osteoporosis are the most common bone complications associated with chronic liver disease, HOA should be considered as part of the differential diagnosis whenever bilateral, symmetrical arthropathy and digital clubbing are present.